Description: Design and construction services for a luxury hotel located on the Arizona Canal waterfront of Downtown Scottsdale. This site design infuses the cultural aspects of the desert landscape in a contemporary interpretation while hosting a canvas for local art. The proposed landscape will serve as a modern interpretation of the Sonoran Desert landscape. Using the natural forms as an artistic inspiration, geometries, patterns, and colors were extracted and studied to help guide the landscape vision. The spaces that emerge from this vision create a strong stage for the incorporation of ‘Art in the Landscape’, giving the opportunity for the local art community to weave within the fabric of the project. Respecting Arizona’s environmental conditions, the design approach will integrate a ‘sustainable’ layering system that is congruent with the vision. This layer will consist of ecologically sensitive planting, native materials, and technologies to help mitigate the urban heat island effect. 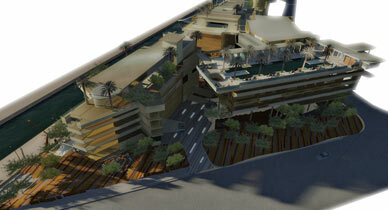 Successfully satisfying this concept, the project could become an iconic destination within Scottsdale.